Halibut -- like other firm, white-fleshed fish such as swordfish -- is one of the best types of fish to broil. Both the steaks and fillets cook up firmly and have a mild flavor that lends itself well to pairing with a wide variety of sauces, seasonings or side dishes. Halibut is rich in potassium, providing 460 mg for every three ounce serving, and is low in calories, cholesterol and saturated fat. In fact, halibut is so lean that you'll need to watch it closely when broiling it to prevent it from drying out. Rinse the halibut steaks or fillets in cold running water and gently pat them dry with paper towels. Place the fish in a shallow glass baking dish. Mix the lime juice and soy sauce in a small bowl. Pour the mixture over the halibut and allow the fish to soak, turning once, for 15 to 30 minutes. Preheat the broiler for 15 minutes before cooking, positioning the oven rack 3 to 4 inches from the heat source. Oil a rimmed baking sheet or 9-by-13 inch roasting pan lightly with vegetable or olive oil. Arrange the halibut in the prepared pan. Broil the fish, undisturbed, for six minutes. Slide a thin-bladed knife into the thickest part of the steak or fillet; if it passes through easily and the innermost portion of the flesh is no longer translucent, the halibut is done. If you're pressed for time, you can omit the marinade. However, be certain to brush the halibut steaks or fillets generously with butter, olive oil or soy sauce to keep them from cooking up dry. 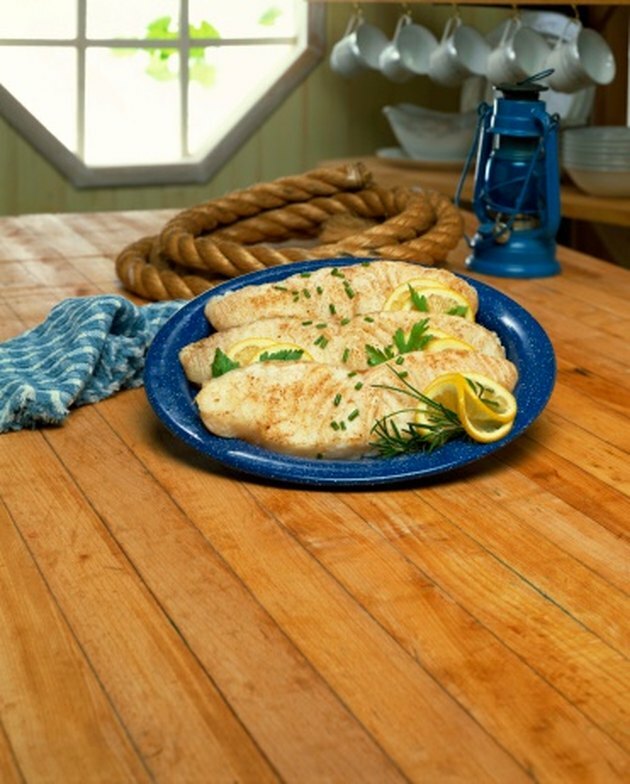 Halibut is excellent topped with chopped fresh herbs or seasoned breadcrumbs just before broiling. It can also be topped after broiling with flavored butter or oil, citrus-based sauces, salsa or an herbed vinaigrette.